“Brand manufacturers as well as consumers are looking for alternatives to plastic packaging materials. 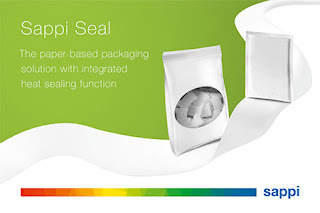 Sappi Seal will contribute to the use of more resource efficient and renewable materials for flexible packaging," says René Köhler, Head of Business Development Packaging and Speciality Papers at Sappi. Sappi Seal was developed for use as flexible standard packaging in the food and non-food sectors, where hot sealing properties are required. This includes primary packaging, such as sachets, but also secondary packaging, such as flow-wraps for sweets, toys or DIY goods. In addition to its excellent hot sealing properties, Sappi Seal also provides a decent barrier against water vapour. The new speciality paper is also recyclable within the paper waste stream. Sappi put great emphasis on user-friendliness when developing this paper. As a result, Sappi Seal can be opened easily and smoothly, without uncontrolled tearing. Its homogeneous and light surface provides good printability and finishing properties with all common finishing techniques. Its natural appearance and pleasant feel ensure an eye-catching brand presence. Sappi Seal is available with FSC or PEFC certification and was produced according to the requirements of recommendation BfR XXXVI (Bundesinstitut für Risikobewertung - Federal Institute for Risk Assessment). Sappi Seal is available with a grammage of 67 g/m2.